Does Spinal Cord Stimulation decrease the Need for Pain Medicine? 23 Apr Does Spinal Cord Stimulation decrease the Need for Pain Medicine? Spinal cord stimulation (SCS) is a life-changing procedure. Patients are turning to SCS to control chronic neuropathic pain, reduce the need for daily opioid medication, and improve quality of life. According to research, SCS has been used effectively for 35 years, and it has helped thousands of U.S. citizens find pain relief. SCS often is used after patients fail on conventional treatment, such as physical therapy, medications, and other therapies. SCS does not cure pain, but rather, it relieves and eliminates the use of addictive substances. The spinal cord stimulator therapy is a reversible procedure. It involves implanting a small device, called a pulse generator, beneath the skin. Thin wires connect to leads, which are implanted along the spinal cord. The implantable pulse generator (IPG) is the size of a half-dollar, and it is placed 2.5 centimeters below the skin, usually in the lower abdomen, upper buttocks, or below the collarbone. The tiny electrodes (leads) are placed in the epidural space, near the spinal cord. Failed back surgery syndrome (FBSS) – This term is used to describe the residual pain that persists despite spine surgery or multiple spine procedures. Complex regional pain syndrome (CPRS) – This condition is often caused by severe trauma, surgery, or injury to a limb. The symptoms include burning pain, skin color changes, skin temperature changes, hyperaesthesia, swelling, numbness, and tingling. Peripheral neuropathy (PN) – This pain is a burning, searing discomfort, and it is often caused by diabetes mellitus or other conditions that affect nerve function. PN pain is also searing/burning/tingling, and it is often associated with weakness and numbness of one or both lower extremities. Spinal cord stimulation is used to relieve the pain associated with neuropathies, CPRS, and FBSS. 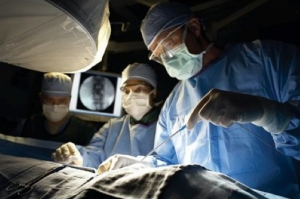 For patients with radicular pain associated with lumbosacral spine surgery, doctors found that SCS had an 85% efficacy rate, which delayed the need for surgery by two years. These studies also show that patients receiving treatment with SCS have a decreased use for opioid medications. In a study involving 5,400 patients, researchers found that it had a 93% success rate. Those who continued SCS therapy had lowered daily opioid doses than patients who had their SCS devices removed. The study showed that patients were able to decrease use of opioid pain medicines. The implantable device used low levels of electrical energy to disrupt pain signal transmission, replacing sensations with pleasant vibrations. Additionally, those who had a successful SCS implant procedure reported decreased pain scores as well. 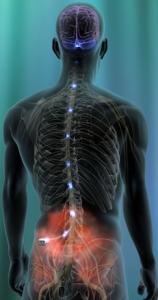 Spinal cord stimulation has been proven to decrease pain scores in many studies. In a recent one-year outcomes report, pain scores were reduced from 77.6 average to 33.6. Back pain went from 75 to 39, and 60% of patients reported more than 50% reduction in pain. Regarding leg and foot pain, 80% of patients reported significant decrease or elimination in pain. Outcomes included improved mood, enhanced quality of life, and overall procedure satisfaction at the 12-month follow-up. Eldridge et al. The Role of Rechargeable Systems in Neuromodulation. European Neurological Review 2011;6:3:187-19. Kumar K, et al. The effects of spinal cord stimulation in neuropathic pain are sustained: a 24-month follow-up of the prospective randomized controlled multicenter trial of the effectiveness of spinal cord stimulation. Neurosurgery 2008 (Oct);63 (4):762-70. Kumar, et al. Spinal cord stimulation in treatment of chronic benign pain: challenges in treatment planning and present status, a 22-year experience. Neurosurgery 2006;58:481-496. Kumar K, Toth C, Nath RK, Laing P. Epidural spinal cord stimulation for treatment of chronic pain: some predictors of success. A fifteen year experience. Surg Neurol 1998;50:110–121. Liem L, Russo M, Huygen FJ, et al. One-year outcomes of spinal cord stimulation of the dorsal root ganglion in the treatment of chronic neuropathic pain. Neuromodulation. 2015;18(1):41–48. National Institute of Clinical Excellence (NICE guidance) (2008). Spinal cord stimulation for chronic pain of neuropathic or ischaemic origin.